In Barbados you get a mega‑vacation that includes 2 resorts for the price of one. Experience 18 restaurants, 12 bars, all the beaches and every amenity. 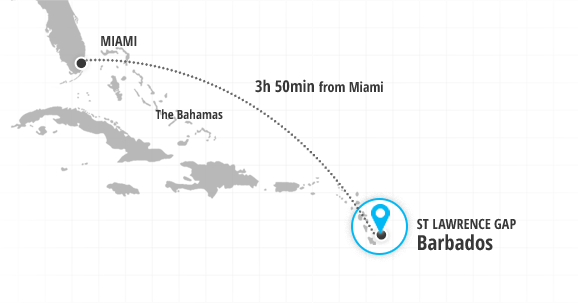 Our resorts are right next to each other, so you can easily walk between them. 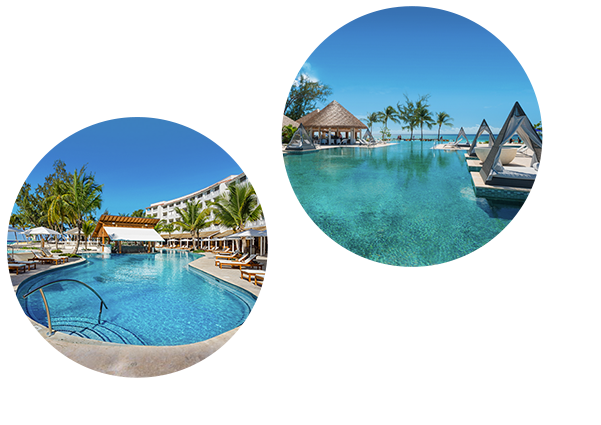 Our resorts are right next to each other, so you can experience it all! 17 Restaurants all included. all unlimited. From Paris to Tokyo, India to Italy, your gourmand soul will revel in the succulence of classic contemporary, and creative dishes served up in both resorts in Barbados. You’ll be an honored guest at any of 17 restaurants, each with its own unique ambience and setting. Overlooking the ocean from its rooftop setting, this zero-entry, glass infinity pool is a Sandals first and one of 34 pools featured at Sandals Royal Barbados. While its rooftop location makes it the perfect place to sunbathe, the surrounding lounge areas and rooftop bar are a great place to relax, cool off and take in the breathtaking vistas. Lovers Lane, Sandals first 4-lane bowling alley, features a colorful backdrop for a romantic evening of couples bowling. The Clip Yard, Sandals first men’s only barbershop, features an intimate and luxurious setting with all the amenities, personalized attention and a skillful stylist that will bring out the gentlemen in you. A Sandals first, Lovers Lane craft beer bar serves 19 different beers from around the world. Take a seat around the wraparound bar, where a built-in strip of ice helps keep your drinks perfectly chilled. Barbados is home to exotic locales, a rich history, and an extensive variety of sports and activities. With a spectacular landscape that changes dramatically from one town to the next, each locale possesses an equally saundry pace, offering activities and entertainment for nature lovers, club-goers, and adventurers alike. Escape to this exotic gem where deep caverns and monkey‑populated forrests abound against the setting of rocky cliffs, white‑sand beaches and sparkling seas.